A rhinestone-encrusted glove worn by Michael Jackson the first time he performed the Moonwalk has been sold at auction for $350,000 (£212,000). The glove, among 70 items belonging to the late singer which went on sale in New York, was sold for nine times the expected price. A jacket worn by Jackson on his 1989 "Bad" tour was sold for $225,000 while a fedora hat went for $22,000. The auction in New York attracted thousands of bidders around the world. 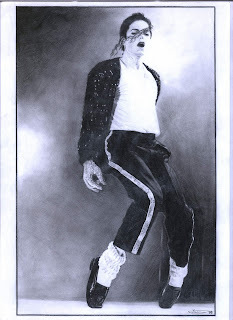 Auctioneer Darren Julien said the 1983 television appearance when Jackson first displayed the Moonwalk - wearing the glove - had been his "most historical performance". Mr Julien said he had had no idea the sale would be so big. Prices for Michael Jackson memorabilia now outstrip those for items belonging to Elvis or Marilyn Monroe, he added. "It's a tribute to his life and career - he's truly an amazing artist," said Mr Julien. The glove was bought by Hong Kong businessman Hoffman Ma on behalf of a hotel in Macau China, where it will now go on display. Including taxes and fees, the final amount paid was $420,000. Michael Jackson died at his home in Los Angeles in June at the age of 50 after a drugs overdose.